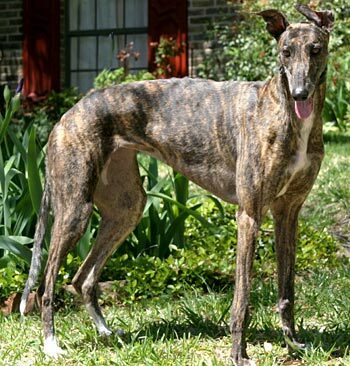 Dinky, aka Gable Dinky, is a beautiful, 3-year-old dark brindle female born February 4, 2007. Her sire is Gable Oscar, making her grand sire the late famous Gable Dodge, and her dam is Jet Set. Dinky has a gorgeous white tuxedo blaze along with very flexible and expressive ears! Dinky’s racing career of two races was at Valley Race Park in Harlingen, TX, in March 2009. She is ready to find her forever home and couch! Dinky's cat and small animal test: Dinky is not cat tolerant, but seemed okay with the pug. Our foster grey Dinky is easy to recognize, even in a "herd" of brindles at a Meet and Greet. Before arriving at GALT's kennel, Dinky had a "mysterious incident" that resulted in the loss of a tiny bit of one ear. We think this just adds to her character and gives her a unique look that is all her own! Since our little Mystery Girl is such a youngster, she is full of energy. She will play any time you're willing, and never says no to a walk or petting session. When she wants to burn some extra energy, she just runs a few laps around the pool in our back yard. Dinky gets really excited when she meets new people, and sometimes she will try to jump up to greet them. She doesn't seem to realize that not everyone loves a big old sloppy greyhound kiss - so we are working with her to keep some of her enthusiasm in check when appropriate. This sweet girl still has a lot of puppy in her, so she's still learning the difference between toys and shoes. Dinky has adapted quite well to her crate and sleeps in it just fine through the night. She also got the hang of house training in no time. 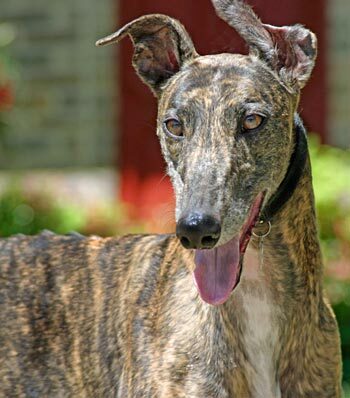 Dinky is a very playful girl with some of our favorite greyhound traits - leaning and roaching! She is currently the only pet in our home and she seems to enjoy being the center of attention. However, she is such a sociable girl, I have a feeling she would get along quite well with most other canines. Keep her away from your kitties, though! What else can I say? Dinky is just a real sweetheart who would love to run a few laps around YOUR pool - or your heart!